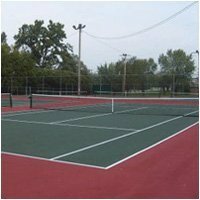 Tennis Court Surfacer & Coating | Asphalt | Concrete | Superior Industries, Inc. Containing a special formulation of lightfast pigments and acrylic polymers, Vista Kote 1000 is a multi-use, permanent, colorful safety finish. Useful in all climates, Vista Kote 1000 is able to protect and preserve concrete, asphalt, wood, and primed metal surfaces. 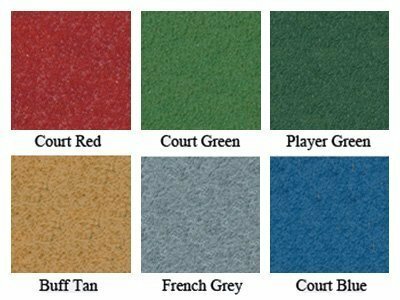 Available in five vivid colors and two tints, this 100% acrylic textured finish is ideal for use on: tennis courts, walkways, driveways, bike paths, pool decks, ramps, steps, and amusement park recreational areas. This textured coating provides for a sure footed surface on tennis courts. 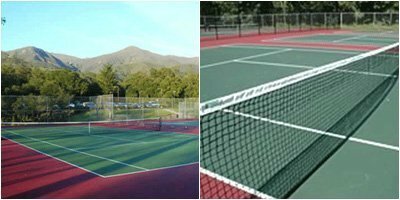 No other product will provide long lasting, durable and vivid color qualities for tennis court surfacing. Permanent, inexpensive, and quick, this slip-resistant coating revitalizes plain surfaces and gives a long-lasting decorative finish. This skid-resistant finish is resistant to extreme weather conditions and is very easy to apply by squeegee or roller. 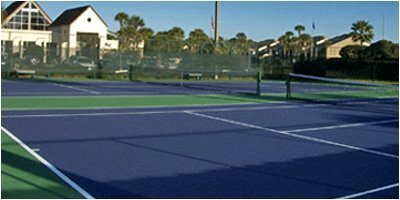 Vista Kote 1000 Tennis Court Surfacer & Coating is available in 1 gallon cans & 5 gallon cans. All you have to do is mix it, pour it, and spread it – all straight out of its container. It comes in five colors, which include: tennis green, court red, driftwood, clay tan, and French gray. ( See Color Chart) We also have pastel and ultra deep tint bases available. Seal, color, and protect your surface with Vista Kote 1000 – you won’t be sorry you did. For those wanting to achieve a rich luster finish, Vista Kote 1000 may be top coated with our Aqua Crete, a urethane fortified water based acrylic sealer. Vista Kote 1000 has a drying time of: 4 hours between coats, 8 hours before foot traffic, and 24 to 36 hours before opening to heavy traffic (at 70°F, 50% humidity, adequate ventilation). See the chart below for coverage rates. We recommend that you only apply this product to hot asphalt or Portland cement concrete recreational surfaces. One or two coats are recommended to do the job. See product label for more specific application instructions. 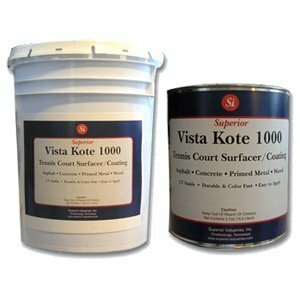 In order to achieve successful installation of Vista Kote 1000 Tennis Court Surfacer & Coating on dense (slick) concrete surfaces and steel surfaces, Vista Kote 1000 Concrete Primer is required (read on below for more details). Note that damaged or unsound pavement with major cracks (1/8” or wider), holes, or shallow depressions (“bird baths”) must be repaired prior to applying Vista Kote 1000 Tennis Court Surfacer & Coating. Do you have cracks that need repairing? 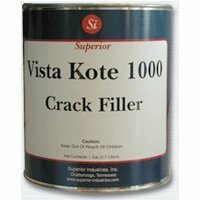 Check out our professional quality Vista Kote 1000 Crack Filler below. Should you have cracks that need to be repaired before applying Vista Kote 1000 Tennis Court Surfacer & Coating, Vista Kote 1000 Crack Filler is a definite must! This acrylic latex crack filler is easy to use on both asphalt and concrete surfaces. Able to fill cracks up to ½ inch, this compound for patching cracks is also able to stay flexible and move along with minor surface expansion and contraction, unlike concrete-based patchers and epoxy-based patchers. Even when the temperature is below zero, Vista Kote 1000 Crack Filler maintains its exceptional flexibility. Offering great exterior durability and excellent adhesion, this acrylic latex crack filler is the product of choice for use on tennis courts, parking lots, driveways, playgrounds, and anywhere else you need a long-lasting, quality solution to a cracked asphalt or concrete surface. Available in 1 gallon containers. 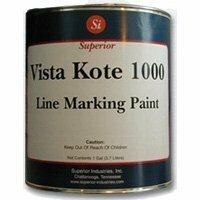 Vista Kote 1000 Line Marking Paint is a textured acrylic line striping paint that creates vivid, bright, sharp lines. Specifically created to work side-by-side with Vista Kote 1000 Tennis Court Surfacer & Coating, this line striping paint is also compatible with other coating systems and can be used on asphalt and conditioned concrete. Vista Kote 1000 Line Marking Paint is the paint of choice for striping tennis courts with 2 inch stripes (as according to USLTA regulations, tennis courts are to be striped with 2 inch stripes for doubles play), and because it is a texturized paint, it forms a helpful slip-resistant coating on tennis courts. It won’t fade or peel, and its heavy body prevents uneven lines and “feathering” under tape during application. Offering great exterior durability and excellent resistance to cracking, Vista Kote 1000 Line Marking Paint is also useful for striping parking lots, playgrounds, and other surfaces that have been coated with Vista Kote 1000 Tennis Court Surfacer & Coating. This striping paint may be applied with a roller or a brush, but spray application is not recommended. Make sure Vista Kote 1000 Tennis Court Surfacer & Coating is completely dry (allow at least 8 hours) before applying Vista Kote 1000 Line Marking Paint. Available in 1 gallon containers. If you’re looking to use Vista Kote 1000 Tennis Court Surfacer & Coating on a dense (slick) concrete surface or another smooth surface such as steel, applying Vista Kote 1000 Concrete Primer is essential to its successful installation. This waterborne acrylic coating can be easily sprayed on or applied with a squeegee or roller. You should apply Vista Kote 1000 Tennis Court Surfacer & Coating while Vista Kote 1000 Concrete Primer is still tacky. 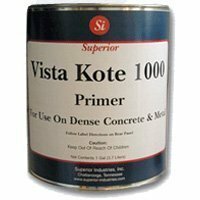 (Note that Vista Kote 1000 Concrete Primer dries tack free in 1 hour.) See product label for more specific application instructions. Available in 1 gallon cans.